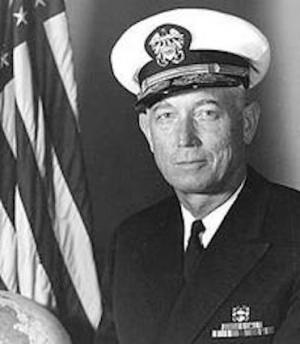 Clarence Monroe “Roe” Hart was a rear admiral in the United States Navy. He was born on April 22, 1918, in Rigby, Idaho, and graduated from the Naval Academy in Annapolis, Maryland, as an engineer and as a graduate of the Navy’s Deep Sea Diving School. He later completed graduate studies at Massachusetts Institute of Technology and Harvard Business College. He was instrumental in re-floating the SS Normandie, a large ocean liner given to the U.S. by France, which had capsized in the New York Harbor in 1942. As a lieutenant in World War II, he supervised salvage operations and had many harrowing experiences saving ships sunk by enemy submarines off the eastern coast. With the rank of commander, he was in charge of salvage operations in the Pacific during the Korean War. His tour of duty took him to the U.S. Naval War College in Newport, Rhode Island, then as production officer for the building of nuclear submarines in Mare Island, California. He became Shipyard Commander of the Long Beach (California) Naval Shipyard, where he advanced to the rank of rear admiral. While at Long Beach, he saved the Queen Mary Ocean Liner from sinking. Admiral Hart's orders took him to Newport News, Virginia, as supervisor of shipbuilding. He worked at the Pentagon with Admiral Hyman Rickover. In the 1960s, Captain Hart went to Washington DC where he was awarded the Legion of Merit, a medal for his work on the guidance system for the Polaris Missile, a nuclear missile launched from a submerged submarine. After his retirement in 1976, he presided over the Texas Dallas Mission of The Church of Jesus Christ of Latter-day Saints. He then joined the Eyring Scientific Research Institute in Provo, Utah, serving as vice president. He also served as a member of the Military Relations Committee of the Church. Hart and his wife, Hazel, have four children. He died on April 13, 2008. This page was last edited on 2 February 2019, at 12:52.